California, Massachusetts, Oregon, Washington and British Columbia. Width: 24 inches (60 cm). Drooping panicles of soft pink flowers held on stems above the foliage. Basal, blue-green, fern-like foliage, glaucous underneath. Moist, humus rich, well-drained soil. Sow in containers and keep at temperatures of 64-71°F (18-22°C) for 2-4 weeks. Then move to reduced temperatures of 24-39°F (-4 to +4°C) for 4-6 weeks. Move to temperatures of 41-53°F5 (-12°C) until the seeds germinate. Divide in early spring or after plant has gone dormant. For many years, I frequently walked by a wooded area in my neighborhood. Western bleeding heart covered the ground under the salmon berries; when they flowered at the same time, it was a lovely scene to witness in spring. Unfortunately, the scene no longer exists. To my disappointment, somebody built a house, ripped the native plants out, and planted grass in its place. There goes the neighborhood. I believe every garden needs native plants growing in it, including this beautiful Northwest native in the Fumitory family (Fumariaceae). The plant spreads by underground rhizomes, but it is not hard to keep under control. I grow it in my own garden, where it romps happily around until its exuberance is too much for the garden. I dig plants out and then let it romp happily again. 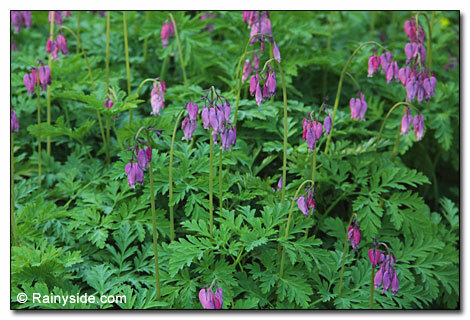 Dicentra formosa commonly grows in moist woods to dry meadows, along stream banks, and from low to mid elevations. 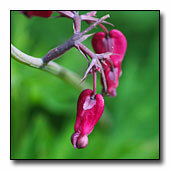 Many fine cultivars came out of breeding work with our native bleeding heart. 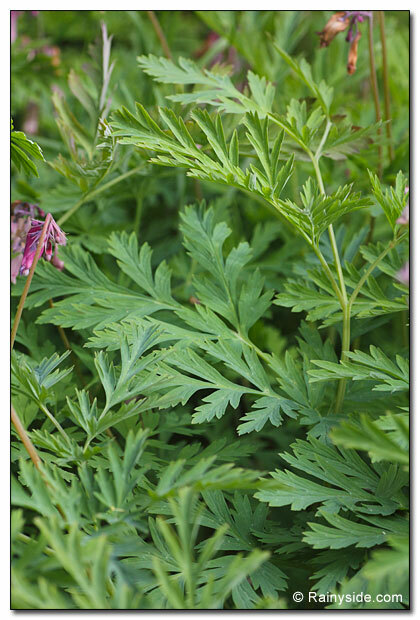 Dicentra comes from the Greek words di meaning two and kentron, which means a spur. Although here in the U.S. we pronounce the genus dy-SEN-truh, in the U.K. they correctly pronounce the "c" with a hard "k" sound-dy-KEN-tra. Its epithet formosa, means beautiful. 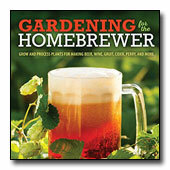 If your garden is plagued with deer, they will pass over this plant. The clodius Parnassian butterflies (Parnassius clodius) lay their eggs on the plant in shady areas; when the eggs hatch, the caterpillars dine on the foliage. I wish I could find evidence of the chompers on my plants; I would welcome my garden playing host to these butterfly larvae. Hummingbirds frequently visit the blossoms when they fill the spring garden with cheery pink hearts. The pink flowers are followed by seed, each carrying a small glob of fat that ants gather. In doing so, they disperse the seed, insuring more colonies of plants. The Skagit people pounded the roots, and made a decoction for worm medicine. For toothaches, they chewed raw roots. To help their hair grow, they crushed the leaves to make an infusion. Although this plant is used in folk medicines, it is not one to fool around with if you do not want to poison yourself. Be careful with young children and animals since all parts of the plant are poisonous. The roots are the most potent. Some people have allergic skin reactions from handling the plants.